Former Wales rugby international Rhys Williams says the World Cup shows the country has "more world class players than anticipated." Villagers from Nigel Owens' home village in Carmerthenshire are celebrating his selection as referee for the World Cup final. 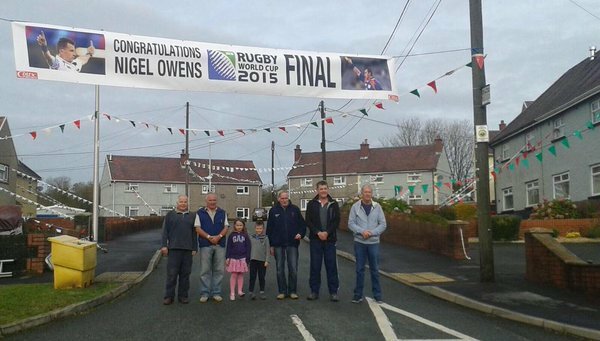 Residents of Nigel Owens' home village have honoured his World Cup Final achievement. A picture posted online by Nigel shows residents of Mynyddcerrig, near Carmarthen, underneath a banner congratulating him on being made referee for rugby's most prestigious match. On seeing the banner, he said it brought "a tear to my eye". A rugby superfan has claimed a world record for the most rugby world cup games attended in a single tournament. Problems around public transport during Rugby World Cup matches in Cardiff are to be examined by a National Assembly committee. John Devereux, a former international rugby player for Wales and the British and Irish Lions, has told ITV News that the Wales team need to look at why they lack that 'cutting edge'. The former right-wing, who played for the national side between 1986 and 1989, also criticised the style of play Warren Gatland has brought to the side.